The Master of Darkness investigates baffling mysteries in two classic pulp novels by Walter B. Gibson writing as "Maxwell Grant." 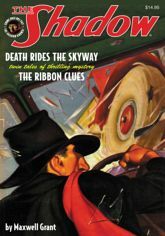 First, The Shadow must unravel the baffling mystery of "The Ribbon Clues" to stop a serial killer and unearth hidden millions! Then, to unmask a diabolical super-crook, The Shadow follows a bizarre trail of murder that leads from San Francisco to Chicago and Manhattan as "Death Rides the Skyway" in an thrill-packed tale of industrial sabotage and deadly greed. This volume showcases classic pulp covers by George Rozen, original interior illustrations by Tom Lovell, and historical commentary by Will Murray.